2018 VAACE/VLF Conference: Adult Ed Works! The Virginia Association for Adult and Continuing Education is an association of adult education practitioners, including city and county adult programs, extension services, government, industry, health service, higher education, and non-profit organizations. VAACE is dedicated to the professional interests and learning needs of its members. VAACE membership is more than dues paid; it represents an exchange of ideas and information, a forum for new developments in adult education and a means to elevate the profession of adult education. Click here to find the WIOA State Plan for the Commonwealth of Virginia. 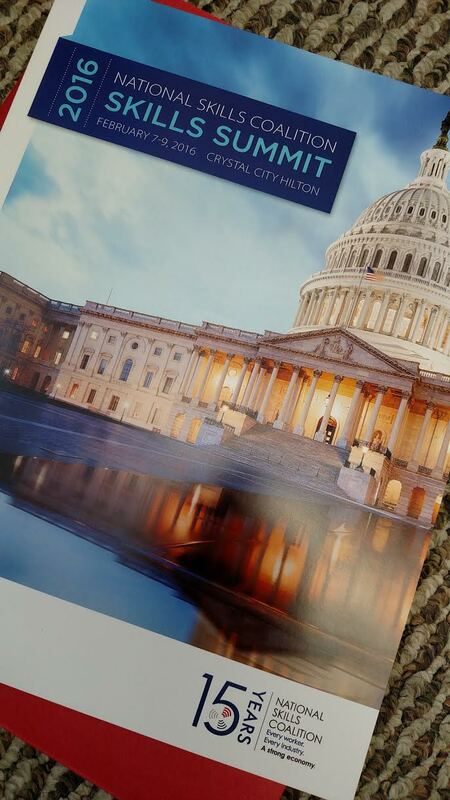 Congress will shortly reconvene in a “lame duck session” to determine spending levels for FY 2017. We need to do whatever we can to ensure that, at a minimum, Adult Education funding is not cut, in the best of possible worlds, gets the increase Congress assumed when it passed the Workforce Innovation and Opportunity Act. The next years are going to be challenging – pressure to cut federal funding will grow, while demand for Adult Education services is likely to increase. We need to work together to protect and grow funding for Adult Education so that more under educated and/or disadvantaged adults are able function effectively and get family supporting jobs or access post-secondary education. In March, the new Administration will unveil its first budget. We need to make sure that it adequately funds Adult Education. Then, in April the Congress will begin the annual Appropriations process. Congress also needs to gets the message that Adult Education is a key component to any growth agenda. We are asking you to weigh in now with Members of the House and Senate Appropriations Committees who will be making these decisions in the weeks and months to come. Please click HERE for a letter that you can use to send to your Senators and Representatives. We are convinced that if we continue to work together, we can make good on COABE’s mission of advocating for more services, more funding, and less waiting. If you are interested in helping out with this, please notify us by clicking HERE. Today we are pleased to announce that COABE and the National Council of State Directors of Adult Education are partnering in an advocacy effort to strengthen and grow Adult Education. COABE is organized to advance national and international adult education and literacy opportunities for all persons. Its more than 15,000 members include adult educators, administrators, and mentors working to improve educational outcomes for adults. The purpose of the NCSDAE is to attend to its members legislative needs and concerns, to work with other adult education organizations to exchange ideas and solve common problems, and to establish and maintain a nationwide communication network regarding national policy and legislative issues. The 50 State Directors and COABE’s 15,000 members across the nation are dedicated to working together to expand access to Adult Education, promote professional development, and support high quality research about the role that Adult education is playing, and can play, in strengthening our Nation’s economy and civil society through civics education. Both organizations agree that this new partnership will make our advocacy efforts more robust, focused and effective as we work together to better our members and our students. Whether you are an educator, an employer, or an agency, you can partner with Adult Education! Find your local adult education provider by clicking here. Dear Colleagues and Friends: Today was an historic day for Virginia’s Community Colleges. The Commonwealth of Virginia will soon invest in high-demand workforce credentials just like it has been investing in our degree programs for the past 50 years. This moment is transformative for individual students seeking another path to success; for businesses that cannot find skilled and trained people to hire for open jobs today; and for our colleges whose workforce development efforts continue to evolve from the aspirational to the life-changing. During a morning ceremony on the State Capitol’s South Portico, Governor Terry McAuliffe signed into law first-in-the-nation pay for performance workforce credentials plan. The broad and bipartisan support this measure carried is reflected in the final votes that assured its General Assembly approval. The House of Delegates endorsed the credentials plan on a vote of 96-2. The State Senate passed it 39-0. The list of people, institutions and organizations responsible for this moment is both and distinguished. The concern of leaving out someone important is the only thing keeping me from listing them all here. I’ve always believed that community colleges are at their best when they respond to community needs. From the 1,500 business leaders who attended our 22 town hall meetings, to the business organizations willing to endorse our proposal, to the elected leaders who engaged and acted on this issue, to the community college leaders and board members who made this tangible, that’s what we’ve done here: respond to a community need. The focus now turns to our community colleges. Virginia’s initial investment in this credentials plan is nearly $19 million. No question, the ability of our community colleges to deliver these high-demand credentials will determine funding in subsequent budgets. This new funding formula will mean the most to individuals who have the most to gain. Instead of being asked to pay the entire cost upfront – as is today’s practice – students pursuing these high-demand credentials will be asked to pay one-third the cost. The commonwealth will pay the college one-third of the cost when the student completes the program as well as the final one-third when the student earns the credential. Our community college workforce leaders are already engaged in the process of securing support from our State Board to endorse eligible high-demand credentials, a process you will soon hear more about. Our current success in workforce development is a tribute to the hard work and imagination of our presidents and workforce leaders. This new funding formula, and initial investment, will position us to modernize and expand our training programs to more fully meet the needs of the people we serve. I don’t believe there has ever been a more exciting time to be doing this work. Virginia’s Community Colleges turn 50 this year. Throughout 2016 we celebrate the progress and promise that highlights our first half-century. Moments like this – the creation of a workforce credentials plan, the pursuit of an ambitious six-year strategic plan – remind us that our best days lie ahead of us and our greatest achievements are yet to be realized. As Dana Hamel, the founding chancellor of the VCCS is fond of saying, “Today is a great day to be alive in the Commonwealth of Virginia.” Sincerely, Glenn Petersburg Chamber of Commerce Troilen Seward is Recognized as an Outstanding Advocate VAACE Advocate Troilen Seward received a national advocacy award recently from the National Association of School Psychologists! 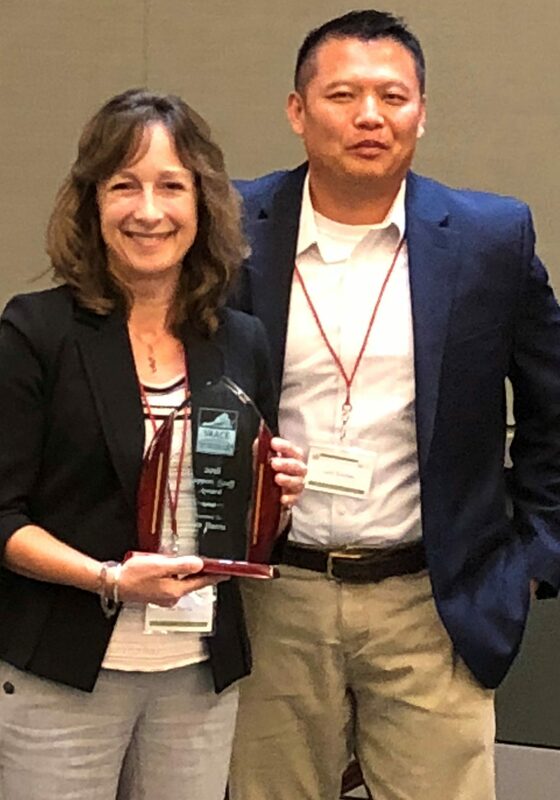 It was the Outstanding Advocate Award in recognition of her dedication to the rights, welfare, education, and mental health of children and youth. It was presented on Feb. 11, 2016, at their national convention in New Orleans. 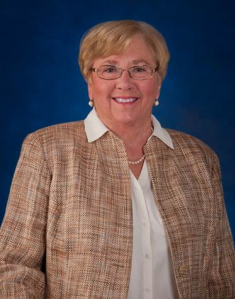 Of this recognition, Troilen said, “I am extremely honored to have received this award. The National Association of School Psychologists is an organization that has always put children first, and for that reason, I have the utmost respect for the work they do. I am so appreciative of being recognized by them. VAACE congratulates Troilen and appreciates her hard work for worthy causes! At the National Skills Coalition, VAACE was represented by Patty Donnelly, Nancy Faux, Shaketta Thomas and Rebecca Scott. Find out more information and important links on the Advocacy page. VAACE members and adult education learners and instructors met with Virginia legislators on January 21, 2016. It was a very special day to share information and personal stories about adult education in the Commonwealth. Check out the message to policy makers at https://youtu.be/yJdrp3G7V4c and the advocacy page. 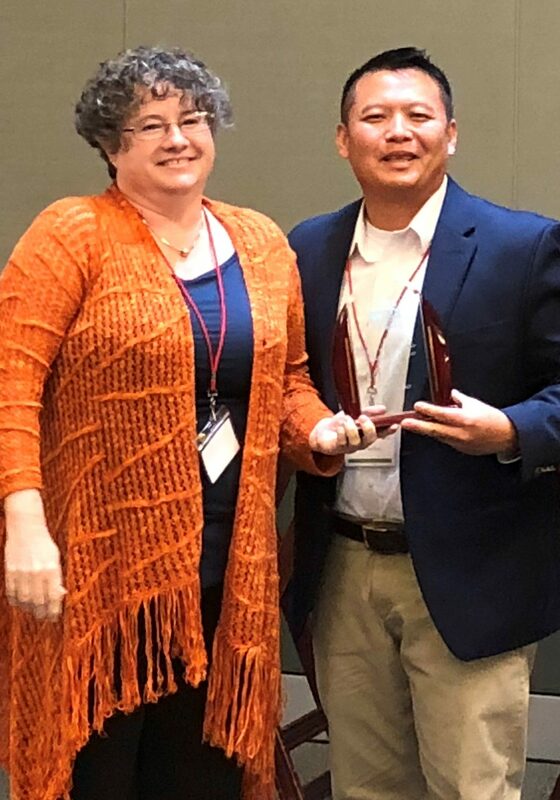 VAACE President Luke Saechao presents Victoire Sanborn with the VAACE Outstanding Educational Leadership Award. 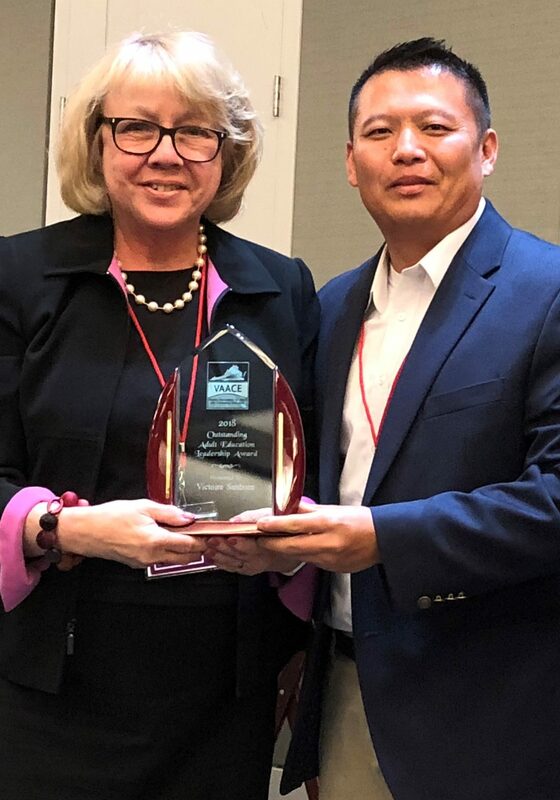 Mary Jo Washko receives the VAACE Outstanding Workplace Partnership Award from VAACE President Luke Saechao. Luke Saechao presents the Joan E.D. Kushnir Teacher of the Year Award to Vici Garber, Region VI Specialist. 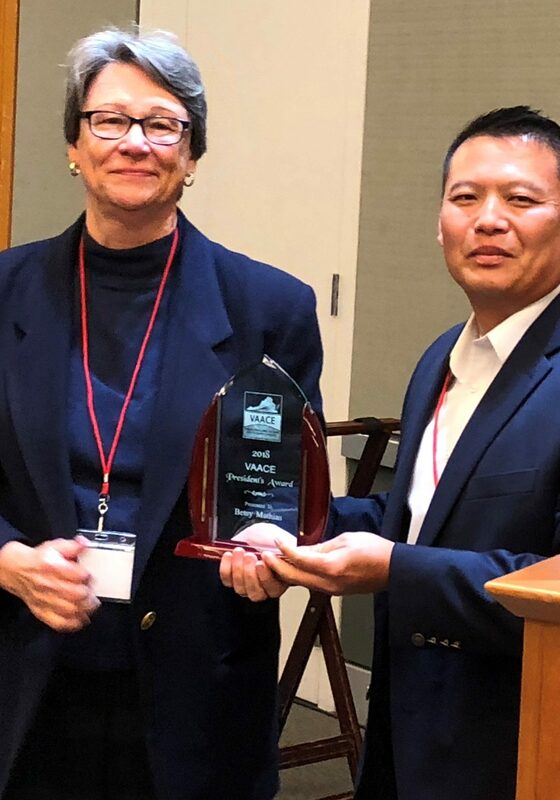 Lisa Harris of Literacy Volunteers of Campbell County Public Library receives the VAACE Outstanding Support Staff Award from Luke Saechao. 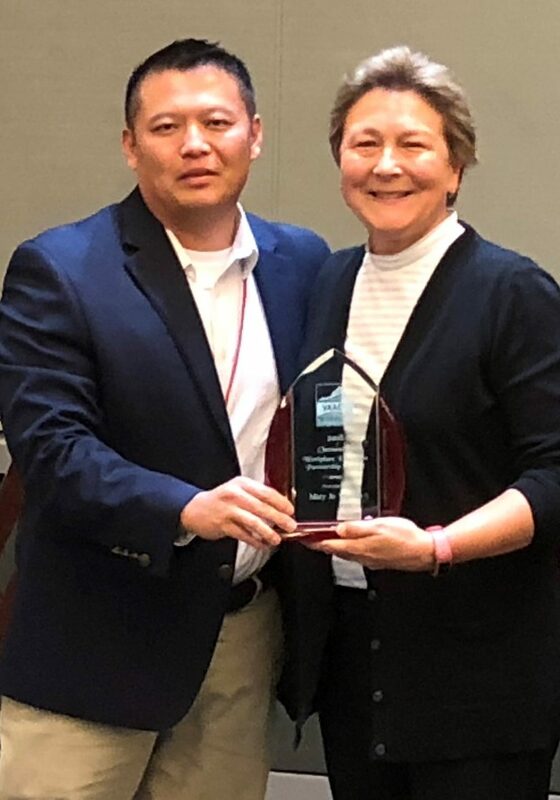 Betsy Mathias receives the VAACE President's Award from VAACE President Luke Saechao. 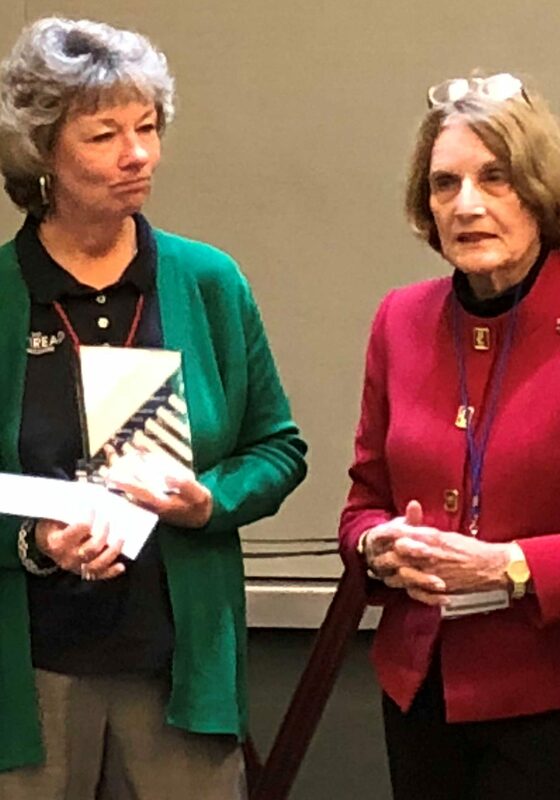 Former Virginia First Lady and founder of Virginia Literacy Foundation Jeannie Baliles presents Karen LaForge with the Nancy Jiranek Award for Outstanding Executive Director of a Nonprofit Literacy Program in Virginia.